If you want to discover an ancient secret for radiant skin and shiny hair that comes out of the desert of Morocco, then I must tell you about the exciting collection that I was sent from Zinn Beauty for this review and giveaway. The four beauty products are argan oil-infused with vitamin E, antioxidants and essential fatty acids. Furthermore, they are certified pure and organic by several leading international agencies. Zinn Velvet Facial Cleansing Milk is what I tested first. This is a creamy and gentle formula perfect for winter when your skin is extra dry. You’ll discover how quickly this product dissolves stubborn makeup without any fragrance. You’ll love how moisturized and soft your face feels once rinsed away as well. I tried the Zinn Revitalizing Anti-Aging Cream next and have been using it for nearly a week. Rich and non-greasy with a lemony sort of scent, this was fantastic for paving the way to flawless skin, especially the longer I used it. I had a small mark left behind from a blemish and watched as this faded it over this period. The Zinn Smooth Body Milk was next on my agenda. This luxurious, faintly orange-scented lotion does deep condition your body and makes dry skin problems vanish. I have red lobster hands in the winter and found this product provided nice relief to help them heal. Finally, I experimented with the Zinn 100% Moroccan Argan Oil. This product is suitable for face, body, hair, hands, and nails. This non-scented oil was great especially when you need the most moisturizing capabilities for your face as possible. I preferred to add a drop or two of this argan oil to my damp, freshly washed face so it absorbed without any traces of oil for a lighter way to moisturize. Other times, I applied the oil straight for heavier coverage. Either method was wonderful from how my complexion responded and glowed. I even tried some on the rest of me as well from hands to my hair and was pleased to see the beautiful results. I definitely loved these products for how wonderfully they worked for me. Do check Zinn Beauty out if you also are hunting for some quality organic beauty products for dramatic results because they don’t disappoint. Thanks to Zinn Beauty, one lucky Nuts 4 Stuff reader in the United States or Canada wins the entire four product collection: Zinn Velvet Facial Cleansing Milk (4.25 oz. ), $29.99; Zinn Organic Moroccan Argan Oil (2 fl. oz. ), $29.99; Revitalizing Anti-Aging Cream (1.69 oz. 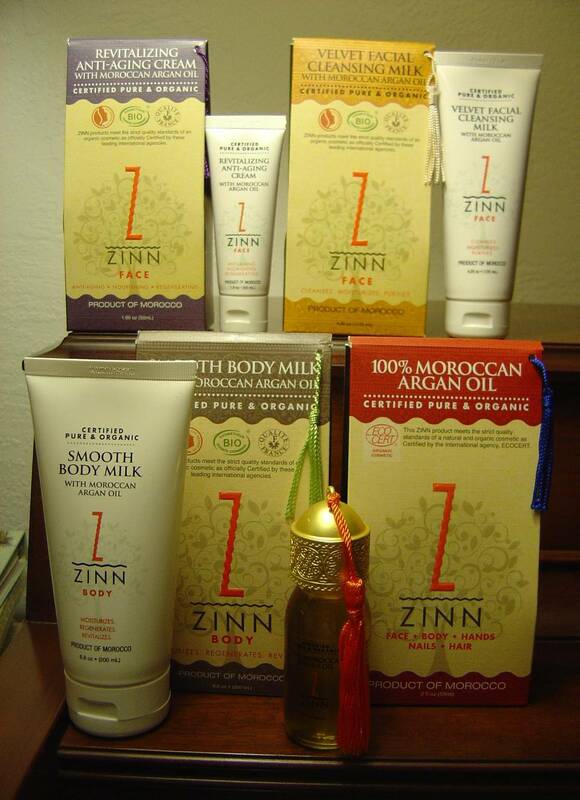 ), $29.99; and the Zinn Smooth Body Milk (6.8 oz.) $24.99 for total value of $115! 2. Go to Zinn Beauty and tell me which product you would love to try first or something you learned from the site in another comment. This giveaway ends February 7, 2012 at 12 PM Eastern Standard Time. The winner will need to respond to my email with name and shipping address within 48-hours or another winner will be picked. I'd love to try the 100% Moroccan Miracle Oil for my damaged hair! 1. I shared Zinn Beauty on my Facebook Wall. 2. I shared Zinn Beauty on my Facebook Wall. 3. I shared Zinn Beauty on my Facebook Wall. 4. I shared Zinn Beauty on my Facebook Wall. 5. I shared Zinn Beauty on my Facebook Wall. I learned that "Argan Oil has long been considered the “Gold” of Morocco." Argan oil has anti-aging properties and helps with stretch marks and blemishes. I would like to try the Velvet Facial Cleansing Milk. Hmmm, I didn't know that Argan Oil debuted at the International Fair in Paris in 1867. I follow you on GFC (brkwalker) and I would love to try the Zinn Velvet Cleansing Facial Milk. I would like to try the Moroccan Miracle Oil for my hair. It needs it this winter. I'd try the Smooth Body Milk. Thanks!! I follow you on GFC as rusthawk and from the site I learned that Zinn’s Moroccan Argan Oil naturally contains antioxidants Vitamin E, Polyphenols, Sterols,Squalene, and Essential Unsaturated Fatty Acids,that protect, nourish, and repair the skin for miracle like results. I would love to have the opportunity to win the Argon Oil to use on my hair and face. I have been under treatment for cancer and both are very dry and aged. I'd love to try the RevitalizingAnti-Aging Cream. I follow you on GFC as jasmyth. I follow you on GFC as Kirsten Perez. I'd love to try the 100% Moroccan Miracle oil for my hair. I'd like to try the 100% Moroccan Miracle Oil. 100% Moroccan Miracle Oil, been wanting to try it for awhile now. I follow you on GFC -Gina WestfallI would lik to try the body milk! I would like to try the Revitalizing Anti-Aging Cream. I'd love to try the anti-aging lotion! Zinn 100% Organic Moroccan Argan Oil. I learned that the company is located in New York, New York. I tweeted the requested message on Twitter at https://twitter.com/#!/likwan/status/166815776148430849. I would like to try the 100% Organic Moroccan Argan Oil.